Thanks to a 19th century novel, the town’s name is synonymous with the routine ordinariness of provincial life – a life that can still be seen in its architecture. The town of Poshekhonye, located in the northern part of Yaroslavl Region, has long served as the epitome of the quiet Russian backwater. 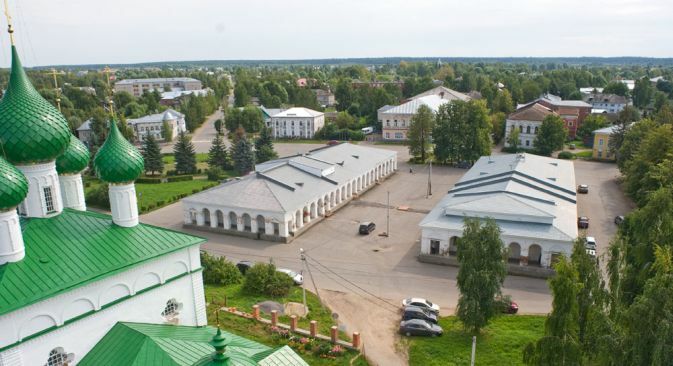 Students of Russian literature will know the town’s name from the last novel of Mikhail Saltykov-Shchedrin (1826-1889), “Olden Times in Poshekhonye,” written in 1887-1889. As depicted in the novel, Poshekhonye is utterly suffused with provincial torpor. In fact, the setting of this heavily autobiographical novel is modeled not on Poshekhonye, but on the large village of Spas-Ugol, where the author spent his childhood. Nonetheless, the reputation stayed with Poshekhonye — perhaps not unjustly. The origins of the settlement are unclear. As early as the 14th century, the area in which the town eventually arose was known as Poshekhonye, meaning “along the Shekhon,” the ancient name of the nearby Sheksna River. In the 17th century a village on the site was called Pertoma after the Pertomka, one of the small rivers that merges with the Sozhoga. In 1777 the village was given its present name, whose sounds even evoke the flow of a river, and elevated to the status of a town as part of the administrative reforms initiated by Catherine the Great. At that point, it witnessed a modest growth with the expansion of regional offices. The settlement already had a large church, the Cathedral of the Trinity, completed by 1717 with a donation from a prosperous peasant, Peter Belovin. The style is simple — a main cube-like structure with a central dome and four decorative cupolas on the diagonals. Beneath the roofline are ornamental gables. A spacious vestibule extends toward the main portal on the west side. The cathedral interior, supported by two large piers, was painted with frescoes. Unfortunately, only fragments of them survived the Soviet period, when the space was used as a store. Restored at the beginning of this century, the cathedral now has a new icon screen. There are daily buses to Poshekhonye from Yaroslavl at 9.50, 10.40, 12.25, 17.20. There are additional buses on Fridays at 18.10 and Sundays at 19.20 and 19.25..
Just to the northwest of the Trinity Cathedral is an imposing four-tiered bell tower completed in the mid-19th century. Its design reflects the Russo-Byzantine style that was widely disseminated by the architect Constantine Thon. The second and third levels offer picturesque views of the town center as well as the confluence of the Pertomka and Sozhoga rivers. The cathedral ensemble was expanded to the northwest with the Cathedral of the Nativity of Christ, completed in 1883 to a design by David Grimm. It was demolished during the Soviet period, but despite this loss, the restored Trinity Cathedral and its bell tower provide the town with a strong visual component. Next to the cathedral ensemble, the town center is organized around the two arcaded buildings of the Trading Rows, built in the 1830s. During the 18th and 19th centuries, such structures were built in an attempt to bring order into provincial Russia’s chaotic bazaars. Although the design of the Trading Rows is less than optimal for contemporary commerce, the town’s appearance has been enhanced by their recent restoration. The Trading Rows merge into Freedom Square, from which radiate streets lined with two-story merchant houses in wood and brick. Although few resources have been given to their maintenance, these houses still show elements of Neoclassical and Russian decorative styles and project a 19th-century aura. The town’s ensemble of houses is complemented by stores and other institutions built at the turn of the 20th century. Indeed, the local economy seems to have advanced little since the small enterprises that operated in the decade before World War I. This limited growth is no doubt one of the reasons for the rare degree of preservation of this provincial environment. Freedom Square is now graced by a grove of tall birches that shelters a memorial to military personnel from Poshekhonye who died in World War II. Nearby is a monolithic red granite statue to Vladimir Lenin. It is said to be the last public monument erected to Lenin during the Soviet period. On the southeastern edge of town near the Pertomka River is the main cemetery, which features the Church of the Dormition of the Virgin, completed in 1822. With its bell tower standing over a rambling vestibule, the church displays a mixture of stylistic elements typical of early 19th-century provincial churches. On the other side of the cemetery is a war memorial dedicated to the Unknown Soldier. In 1918, the town was renamed Poshekhonye-Volodarsk after the assassination of Bolshevik activist V. Volodarsky in Petrograd in June of that year. Such name changes under the new regime had little to do with local initiative, and this case was a particularly absurd imposition on a hapless small town. Poshekhonye regained its original name in 1992. Rising water levels as a result of the creation of Rybinsk Reservoir in 1941 led to the submerging of some parts of Poshekhonye, but the historic town center survived and even benefited from the more ample waterways. In recent years Poshekhonye has witnessed a slow decline in population, from a high of some 8,000 in 1989 to just under 5,900. Although development prospects are uncertain, the survival of the historic environment contributes substantially to the town’s identity and its cultural potential.